Due to intimal hyperplasia instent reobstruction in the femoropopliteal arterial segment is still an unsolved problem. Different techniques have been discussed in case of reintervention to guarantee longlasting patency rate. 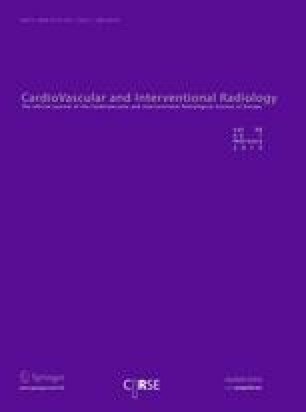 We conducted a randomized, controlled, pilot trial comparing Silverhawk atherectomy with percutaneous transluminal angioplasty (PTA) in patients with a first instent reobstruction in the femoropopliteal arterial segment, to evaluate intima media thickness (IMT) within the treated segment, as a parameter of recurrence of intimal hyperplasia. In a total 19 patients were included: 9 patients in the atherectomy device and 10 patients in the PTA arm. IMT within the treated segment was statistically significantly elevated in all patients treated with the Silverhawk device versus the patients treated with PTA. The obvious differentiation in elevation of IMT in nonfavor for patients treated with the Silverhawk device started at month 2 (max IMT SH 0.178 mm vs. IMT PTA 0.1 mm, p = 0.001) with a spike at month 5 (max IMT SH 0.206 mm vs. IMT PTA 0.145 mm, p = 0.003) and a decline once again at month 6 (max IMT SH 0.177 mm vs. IMT PTA 0.121 mm, p = 0.02). The values for mean IMT performed the same way. Although Silverhawk atherectomy provides good results at first sight, in the midterm follow-up of treatment of first instent restenosis it did not perform better than PTA as it showed elevated reoccurrence of intimal media hyperplasia. M. Brodmann: Honoraria from Bayer Healthcare, Böhringer Ingelheim, Actelion; P. Rief: FWF no conflict of interest; H. Froehlich: Grants pending from FWF; A. Dorr: no conflict of interest; T. Gary: Grants pending, Honoraria Bayer Healthcare; P. Eller: Grants pending, FWF; F. Hafner: no conflict of interest; H. Deutschmann: no conflict of interest; G. Seinost: no conflict of interest; and E. Pilger: Honaria from Bayer Healthcare, Böhringer Ingelheim, Takeda.